We hope everyone had a frightful and Happy Halloween last week! In Santa Barbara we are still recovering from our Halloween festivities. Commission Junction just finished a scary whirl wind content tour and had a presence at three recent content events in October. 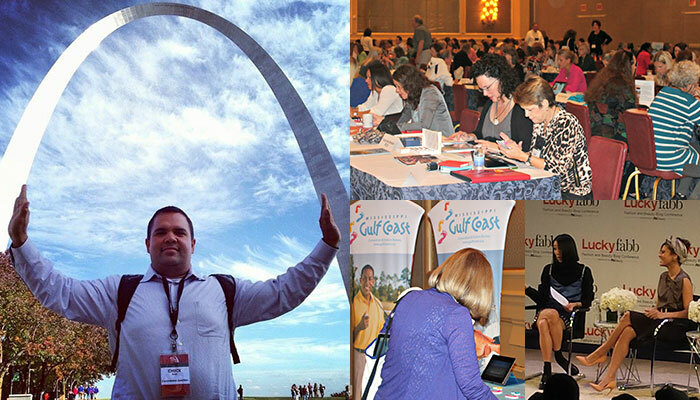 Chuck Ryan, Publisher Business Development Manager, traveled to St. Louis to attend FinCon. FinCon was a great opportunity for us to meet new and speak with existing Commission Junction finance bloggers and to learn more about how we can help them monetize their content and provide more value to users. "Everyone one was really excited we were there and had a ton of questions and ideas to share." said Chuck. Chuck also attended a few WordPress training sessions to learn more about how these publishers publish content and what content tools will be most beneficial. Lindsey Kerr, a Publisher Account Executive who is passionate about supporting content publishers, just got back from New York after attending the Lucky Magazine Fabb Fashion and Beauty Blog Conference. Lindsey chatted it up with some of the top Fashion bloggers in the space about the benefits of working with Commission Junction. Sarah Crosby, Product Business Development Manager, participated in monetization panel with Google AdSense and FeedBlitz at the Society of American Travel Writers conference in Biloxi, MS. It was a great opportunity to present all the recent content innovations we have created including the Deep Link Generator, Product Widget and Content Certified program to help make it easier for travel content publishers to work with Commission Junction. This is just the beginning of our efforts to recruit new content publishers, help existing publishers earn more commissions and develop new innovative content tools that benefit both our advertisers and publishers so check back for future content announcements! The Content Certified program jumpstarts relationships between pre-qualified content publishers and category-specific advertisers looking to expand their brands within quality environments.